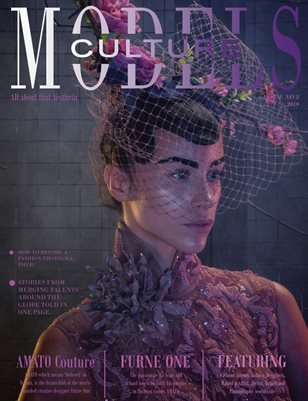 MODELS CULTURE MAGAZINE – “Timeless Fashion” ISSUE 3 March 2019 It takes one idea to spark a revolution, be it professional, political or personal. Fashion is no exception. Sometimes worlds fuse in a way beyond our comprehension. Pioneers in the field have to take our hands, to lead our cultural horse to water, pull the scales from our eyes. Then watch as the moment of genius dawns upon us. I recall what Alexander McQueen once said ‘Give me time and I’ll give you a revolution’. A true motivation of deep determination from a great British fashion designer. The new frontier, boundaries laid to waste as we realize that the limits of the human imagination are the danger, that to live beyond fear is really where true artistry is. As from 15 years, old schoolboy built his empire of now AMATO COUTURE.